The recent New York Times op-ed, “Reign of Recycling” by John Tierney is dead wrong about recycling and completely misses the big picture: We live on a beautiful and finite planet that we are trashing at a rapid rate. Recycling, a central tenet of Zero Waste, has a critical role to play in turning this daunting situation around. Nearly 20 years ago, The Times published a similar article by Tierney, “Recycling is Garbage,” which dismissed recycling’s importance using the same stale arguments. What’s changed since then? A lot. For starters, recycling has been embraced across the country with impressive results. 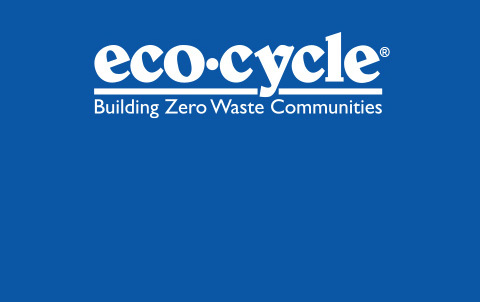 Since 1996, we’ve recycled and composted more than 2.6 trillion pounds of materials in the United States. And our recycling industry has grown significantly, today providing more than 470,000 jobs nationwide and generating more than $105 billion in economic activity. Instead of paying to landfill valuable resources, cities can often make money recycling them. Meanwhile, the urgent challenges humanity is facing, which Zero Waste can help address, have intensified. Climate change is the biggie. Scientists now tell us that we must reduce greenhouse gas emissions as much as 70 percent by mid-century if we are to have any hope of avoiding global warming’s worst impacts. And then there’s the staggering reality of 7-plus billion people on Earth, who rightly aspire to a comfortable standard of living. But think about this for a second: If every person consumed as much stuff as the average U.S. citizen, we would need the equivalent of more than four Earths to support all of us, and we’re heading towards 9 billion people. Could we flee to Mars and get by on potatoes grown in our own poop as Matt Damon did in The Martian? Maybe, but frankly, we think most of us would rather stay home. Staying home means wising up. According to EPA, the way we produce, transport, use and dispose of products and food generates 42 percent of U.S. greenhouse gas emissions. That’s way too much to ignore. Can recycling help? You bet. Recycling, and more broadly Zero Waste, replace our linear, fossil-fueled, and consumption-addicted economies with circular, more sustainable and more equitable ones that reduce greenhouse gas emissions and conserve our precious natural resources. Recycling facilities now outnumber landfills two to one. More than 70 percent of the U.S. population has access to curbside recycling through more than 9,800 programs. Communities such as Portland, Oregon, are recovering 70 percent of their recyclable materials from the trash. More than 200 U.S. communities compost food scraps from residents. WHERE ELSE DID TIERNEY GO WRONG? Recycling and Zero Waste are about natural resource conservation, creating green jobs, combating climate change, protecting public health and ending social injustices. Saving landfill space is not a compelling reason to recycle. Besides, municipal landfills are full of toxics, and they leak all too often. The good news is that if we maximize our recycling potential and practice Zero Waste, then we either won’t need to build more landfills or we’ll need far fewer of them. Recycling is good for business. Who says so? Industry titans including General Motors, Toyota, Sierra Nevada and Xerox—all recycle and have committed to Zero Waste to improve their bottom line. And wait, there’s more: corporate giants Unilever, Philips, Google and Hewlett Packard are embracing the circular economy as the new way of doing business. Recycling helps to significantly reduce the greenhouse gas pollution driving climate change. Tierney argues that we should recycle only those materials that have the biggest climate impact and calls out plastic bottles for having a relatively small impact—the key word here being “relative.” This is wrong on two fronts. First, climate change is an urgent, global challenge that requires many solutions, including recycling plastics, if we are to have any hope of avoiding the worst impacts of climate change. Clearly, we need a myriad of solutions to help us counter the effects of greenhouse gas emissions. Second, all those plastic bottles really add up. If everyone in the United States recycled only their plastic water bottles for one year (all 42.6 BILLION of them), that would offset the greenhouse gases generated by 1,065,000 round-trips between London and New York in coach every year. Recycling creates jobs and communities are investing in recycling for that reason. For example: Michigan’s Republican governor is reinvesting in the state’s household recycling programs in order to create jobs. The U.S. could create 1.1 million new jobs by recycling 75% of our discards. 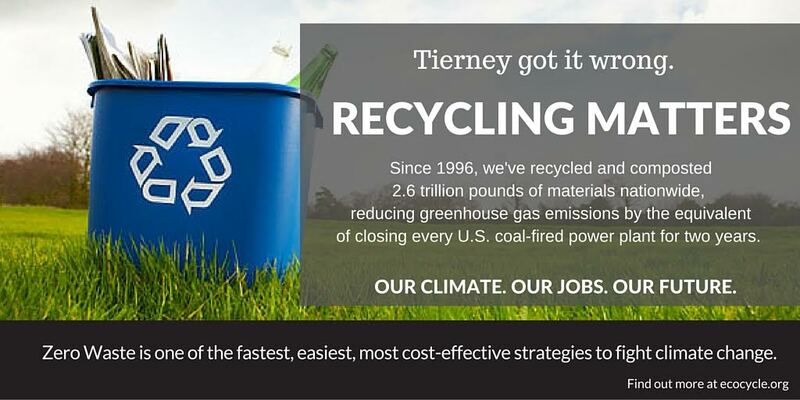 Tierney completely missed the jobs benefits of recycling and Zero Waste and looked only at the direct costs of recycling compared to landfills. Low commodity prices are not a sign that recycling isn’t worth it as Tierney suggests. Our supplies of fresh water, fossil fuels, metals and other resources ARE already scarce and limited in parts of the world. Will we run out completely? Probably not, but these materials may become so expensive that only the super-rich or uber-powerful will have access to them. In the next 50 years, we’re likely to run out of silver, copper, and oil, just to name a few. Prices are projected to rise and communities and business are investing in recycling to meet rising global demand. Recycling significantly extends the life of many materials, sometimes indefinitely as is the case with aluminum. And here’s the biggest thing that’s changed since 1996: Communities around the world are not only embracing recycling, they’re going for Zero Waste. Zero Waste asks us to reimagine how we live and what we truly value. It requires creativity, ingenuity, and perseverance to redesign our systems and resource use — from product design to disposal— so that we can use fewer resources, conserve energy, mitigate climate change, reduce water usage, prevent the creation of toxins, and stop ecosystem destruction. Zero Waste also captures materials we would normally throw away and uses them, instead of natural resources, to make new products, creating far less pollution and feeding local economies. And as luck would have it, Zero Waste turns out to be one of the fastest, easiest, most cost-effective ways a community can reduce its climate impact. It’s time to stop whining about taking out the recycling and get busy building the Zero Waste communities of the future. Our kids will thank us.